A note from a few years back now ! Lunar Festival is not on this year, i will be at ALSO festival in Warwickshire. 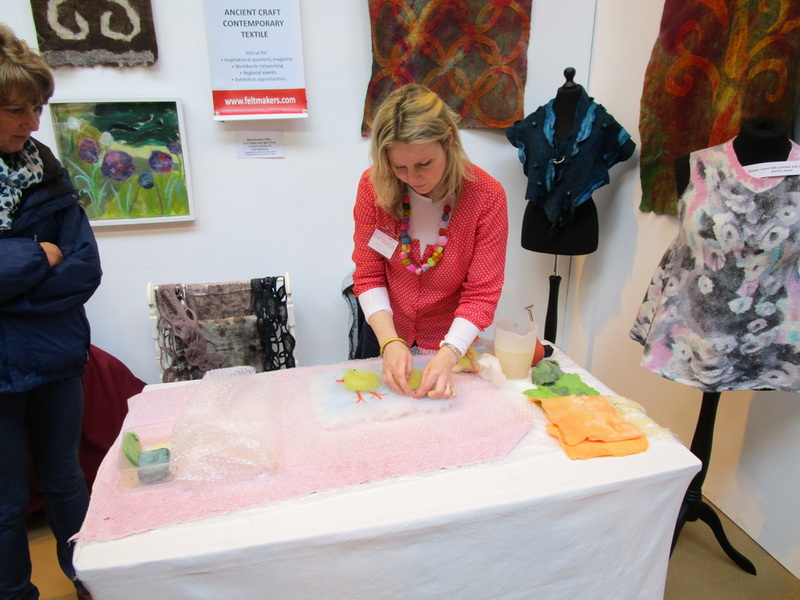 Lunar Festival - Felt making workshops ! On the 5-7th June I taught my felt making workshops at Lunar Festival, on the Umberslade Estate, Tamworth In Arden. The festival was a wonderful weekend with a great vibe, some excellent music, and so much creation everywhere with the artworks, costumes and design work. It was easy to be inspired in this beautiful landscape and there were plenty of creative workshops to get involved in. It was rather windy on Saturday for felt making so everyone had to hold down their wool, but it was a perfect sunny day on Sunday with only a few wispy clouds. Unlike last year, there was absolutely no mud anywhere ! Well done to everyone for their lovely designs! Some delightful designs were made of tropical fish, foxes, toadstools, butterflies, owls, bats and rainbows, and the Lunar Crow as a design which was just brilliant! There were cats ears, a wonderful creature mask, flowers and just some wonderful swirls and splashes of bright colours and fluffy bits of wool everywhere. It was lovely being there with all the tipis and yurts in the Pink Moon Meadow. Working and sharing my skills at this festival was just brilliant. It was lovely to chat to people as they teased out their wool, and find out where they had travelled from, and their festival experiences, which bands they had seen and what wonders they had encountered. I hope you've spotted your felted souvenir amongst the pictures! I can 't wait until next year already ! I found out recently that Mimi one of my tutees has been accepted at her new school as an Art scholar so I am thrilled for her ! I helped her develop her sketchbook work and produce a felted wall hanging based on her holiday in Italy. It's my second successful tutee to gain an Art scholarship ! My work from the Warwickshire open Studios exhibition was exhibited in Coventry at the University Hospital at the start of the year, I had an e-mail from some out patients at the hospital to say how much my work cheered them up on their visit, so I am thrilled about that. I hope you enjoy looking at my work and do get in touch if you would like to commission anything or do a workshop in felt making. 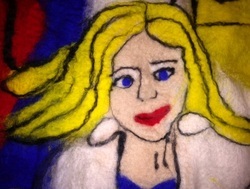 I am a felt artist, and have been making felt since 2002. I am fascinated by the history of felt making and love drawing with the vibrant colours of the wool to create my designs. Felt making for me is highly satisfying and makes me very happy! 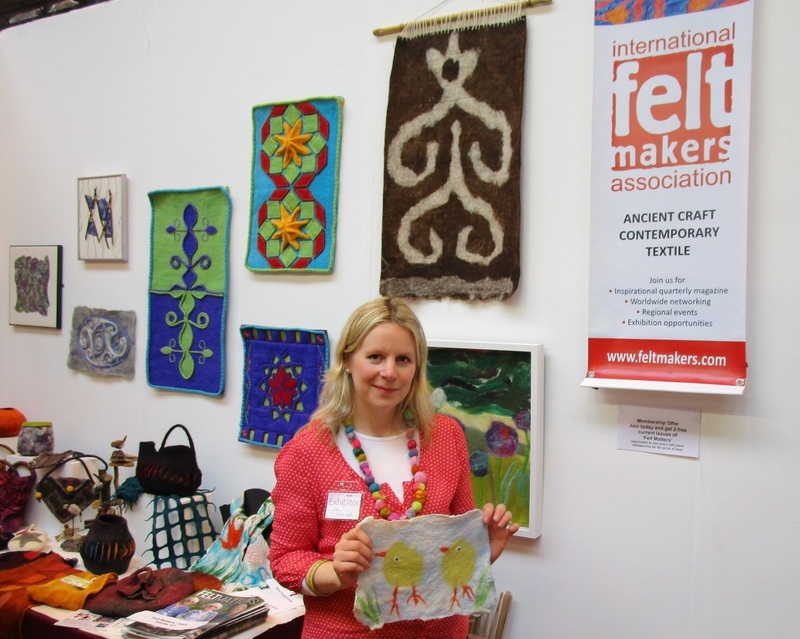 I started my business in 2002, designing a range of bags and cushions that featured hand felted designs in London. I supplied orders to shops after exhibiting at Top Drawer and East London Design Show, and having editorial coverage in Time Out magazine for Christmas stockings. I also had some commissioned designs for the National Gallery, and St Paul's Cathedral shop in London, and a boutique in Milan. All of my designs can be seen on my previous website here and are available to order. 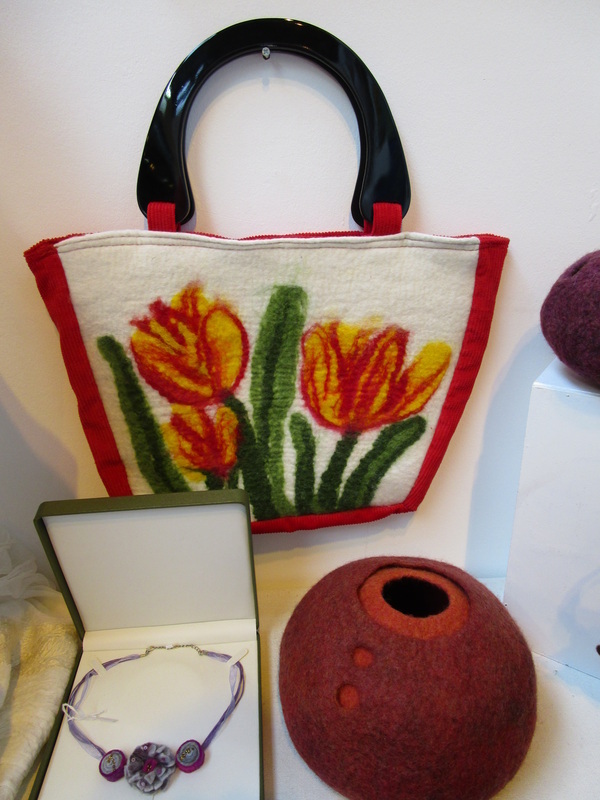 I now sell my range of felted items directly to the customer, where I create bespoke commissions. I also really enjoy inspiring others with teaching the felt making process at workshops and going in to schools as a visiting artist. My designs are fun and quirky, using bright fresh colours and simple forms. Some designs are impressions of nature from fruits, flowers and butterflies, other designs are spots or stripes of colour, and fire bursts of several colours. Popular themes include pets, favourite foods, and personalised Christmas stockings. These latter designs are known as 'Pop Felts'. I have always had a love of textiles, and producing sculpture work on my degree mainly involved using a sewing machine, with creating fun costumes for performance work and installations. The ideas for my degree show developed into the notion of producing artwork about the self, and so my whole degree show was based on that. 'Narcissistic Greenhouse' featured in The Guardian, and was part of a group exhibition in Paris in 1999. After my degree, I worked as a props buyer and set dresser for small productions, including 'Teletubbies' for the BBC. I worked for Tate Britain, and enjoyed walking past a Picasso every morning! At the same time, I developed my passion for teaching art and textiles. I also paint murals and create props for parties and themed events. I am interested in working on a larger scale with making more felted wall hangings for interiors and experimenting also with incorporating other textile techniques to create a new range of designs. I have developed some screen print designs based on the theme of 'Journeys', and would like to work on these further.